Mayor Isla Tullos of Raymond receives Texas flag from Steve Lucas of the Texas Sons of Confederate Veterans. The flag flew recently over the Alamo. 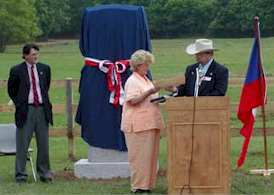 On Saturday, May 4, 2002, the Texas Historical Commission dedicated the first monument to be placed on the recently acquired Raymond Civil War Battlefield. The day was as gray as the uniforms of the Confederacy. The mood was somber as Texas and Mississippi combined forces to honor the Texans who served in the Battle of Raymond. Located just north of Fourteenmile Creek and east of the Highway 18 right-of-way in Raymond, the large red granite monument can be seen easily from the roadway. Many Mississippians and Texans gathered at the site to witness the historic occasion. Dan Laney, President of the Austin Civil War Round Table, Austin, Texas, was Master of Ceremonies. 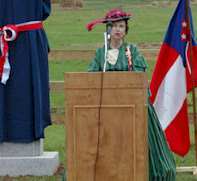 Dressed in Confederate uniforms, members of Captain James P. Douglas Camp 124, Tyler, Texas and East Texas Brigade-Sons of Confederate Veterans, posted the colors with many flags of the Texas Confederate units as well as the United States flag. Steve Lucas, Texas Sons of Confederate Veterans, presented a Texas Flag, which recently flew over the Alamo, to Raymond Mayor Isla Tullos - a proud moment for the mayor and the town. Jean Ann Ables-Flatt, Commissioner of the Texas Historical Commission gives welcome at the dedication. 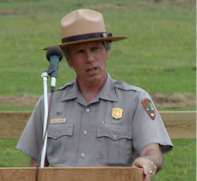 Terry Winschel, Historian, Vicksburg National Military Park, introduces the speaker at the dedication. 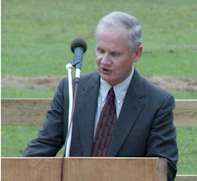 Brigadier General Parker Hills, U.S. Army (Retired) and Civil War Historian, delivers remarks on the Battle of Raymond. David McCain, treasurer of Friends of Raymond, welcomed all those attending. Jean Ann Ables-Flatt of Terrell, Texas, Commissioner of the Texas Historical Commission, gave the welcome from the Commission. After recognition of special guests by Dan Laney, Terry Winschel, Historian of the Vicksburg National Military Park, introduced the speaker for the occasion. Brigadier General Parker Hills, U.S. Army (Retired), and well-known Civil War historian, vividly described the Battle of Raymond in all its intensity. The sacrifice of the Texas Confederate soldiers, as well as those of Mississippi and much of the South, was depicted. 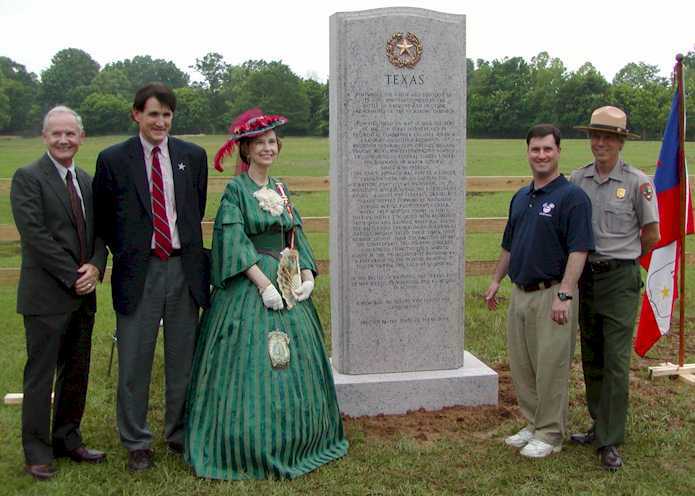 Key participants in the Dedication of the Texas Monument: Parker Hills, speaker, Dan Laney, Master of Ceremonies, Jean Ann Ables-Flatt, Commissioner of Texas Historical Commission, David McCain, Friends of Raymond, and Terry Winschel, Historian, Historian, Vicksburg National Military Park. 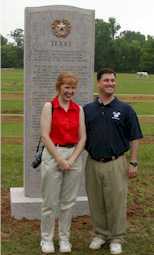 Dan Laney, David McCain and Jean Ables-Flatt then unveiled the monument. Mr. Laney read the front panel inscription. Local musicians and Civil War enthusiasts Jim Woodrick and Tim Waltman, also the guitarist, entertained with period songs. Closing remarks expressing appreciation to all who played a part in the project, were offered by Commissioner Ables-Flatt. 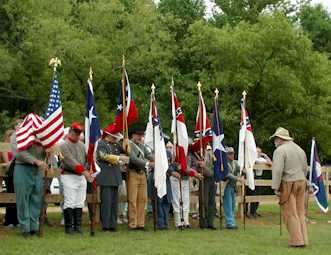 Members of Captain James P. Douglas Camp #124, Tyler, Texas & East Texas Brigade-Sons of Confederate Veterans, post the colors. 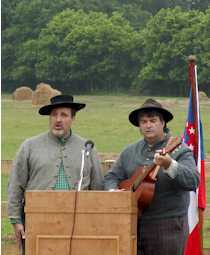 Jim Woodrick and Tim Waltman, Mississippi musicians and Civil War enthusiasts, perform period songs at the dedication. After the dedication program, all were invited to come forward and view the monument. The back panel lists the Texas units engaged in the Vicksburg Campaign. The footstone credits those responsible for the monument: The Texas Historical Commission, Friends of the Texas Historical Commission, Austin Civil War Round Table - Austin, Texas, Morse Family Foundation - Austin, Texas, The Society of the Order of the Southern Cross, Strasswender Memorials - Austin, Texas, and Other Friends Who Cherish Undaunted Courage. 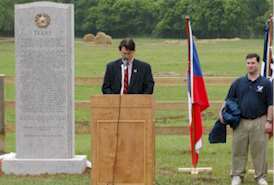 The Dedication of the Texas Monument represented one of the most memorable days in the history of Raymond. It seemed fitting that Texas was the first to erect a monument in memory of those who fought. "Texas Remembers and Honors Her Sons: They Sleep the Sleep of the Brave." ENGAGEMENTS OF THE VICKSBURG CAMPAIGN. OF MAJOR GENERAL JAMES B. MCPHERSON. CITY OF VICKSBURG ON THE MISSISSIPPI RIVER. WHERE THEY MET THE ENEMY IN FORCE. BRIGADE FACED THREE TIMES THEIR NUMBER. FORCED FROM THE FIELD AROUND 4:30 P.M.
DURING THE SIEGE OF VICKSBURG. 22 MEN KILLED, 73 WOUNDED, AND 63 MISSING IN ACTION. A MEMORIAL TO TEXANS WHO SERVED THE CONFEDERACY.